The mission of the Quilts of Valor Foundation is to cover ALL combat service members and veterans touched by war with comforting and healing Quilts of Valor. This foundation is not about politics. It's about people. 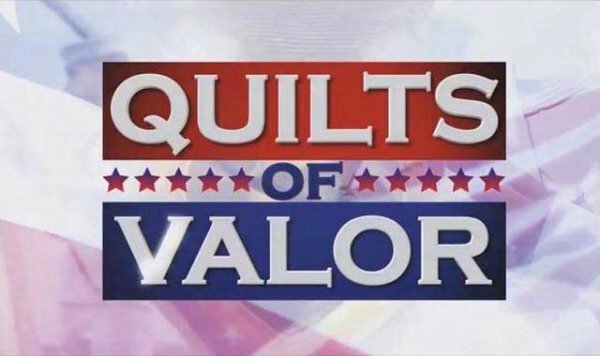 Recently, the Kansas City Area Quilts of Valor (KCA QOV), along with the Kansas Bee in Wichita, awarded over 500 quilts at Ft. Riley to a returning unit that had been serving in Afghanistan. Ft. Riley is asking for another 350 quilts, so you can see that our work is never done! We spend the day making quilt tops, sewing binding onto the quilts, hand finishing the binding, making blocks to add to potential quilt tops and, oh yes, having a lot of fun. Whether you come for the entire day or an hour, your talent is welcome to create these beautiful quilts for deserving servcemen and veterans. Most of our quilts are presented to local servicemen and veterans so your efforts stay within the Kansas City area.